Here you will find regularly the latest news from Ledato. Visit us at the embedded world exhibition and convention in Nuremberg from February 28 to March 1, 2012. Ledato will present his products in hall 1 at stand 1-303. The hightlight this year is PicosG20. With PicosG20 we offer a new compact CPU module, which is housed in a 50pin. CompactFlash housing. We would be happy to send you free tickets to the exhibition. We are pleased to announce that Ledato is now able to offer the NanosG20 with more storage capacity. The energy-saving Linux Mini Computer (energy consumption < 1W) can now be purchased with 512 MB NAND Flash and 128 MB SDRAM memory capacity. The developer bundle and the NanosG20 are already available with more memory. The Ledato Team would like to invite you to join us at the embedded world exhibition and convention in Nuremberg from March 1-3, 2011. We will present our products (NanosG20, xmegaA1-Board, SAMDIP-7S and SAMDIP-7X) in Hall 12 at Stand 12-402. We would be happy to send you free tickets to the exhibition. We look forward to welcome you. We are happy to present the new NanosG20. This Linux computer consumes just 200 milliwatts during normal use. Its diverse interfaces allow you to connect Nanos quickly and efficiently into its environment and offer a wide variety of usage scenarios. The full-fledged operating system Debian Linux ensures a comfortable environment and direct access to common Linux software like Samba, Apache and other powerful network applications. 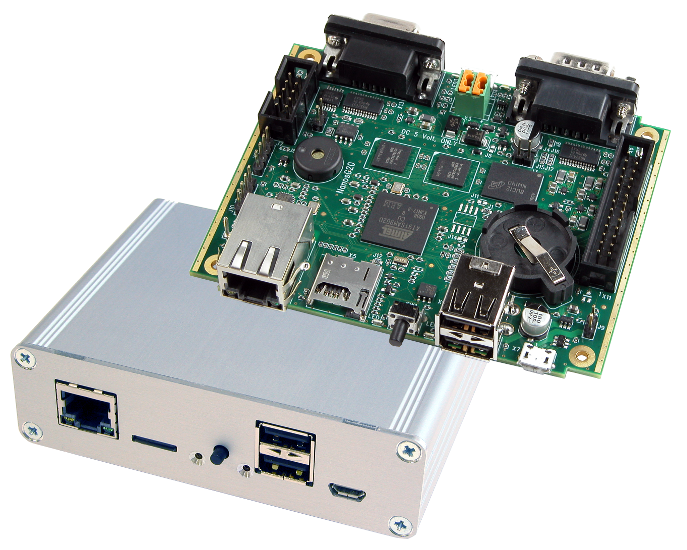 The low-down on Nanos: What runs under Linux on your desktop will run on your Nanos. NanosG20 comes with its own compiler, allowing easy program development. There is no need to install additional software on a development computer. 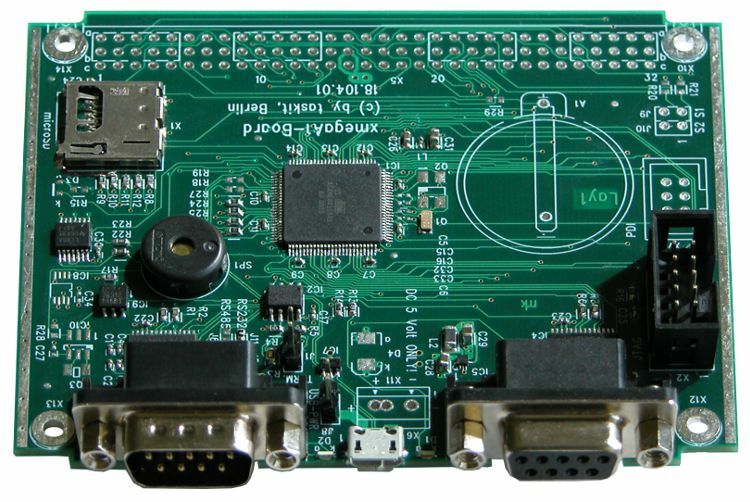 Ledato now offers a new microcontroller board -- the xmegaA1-Board. 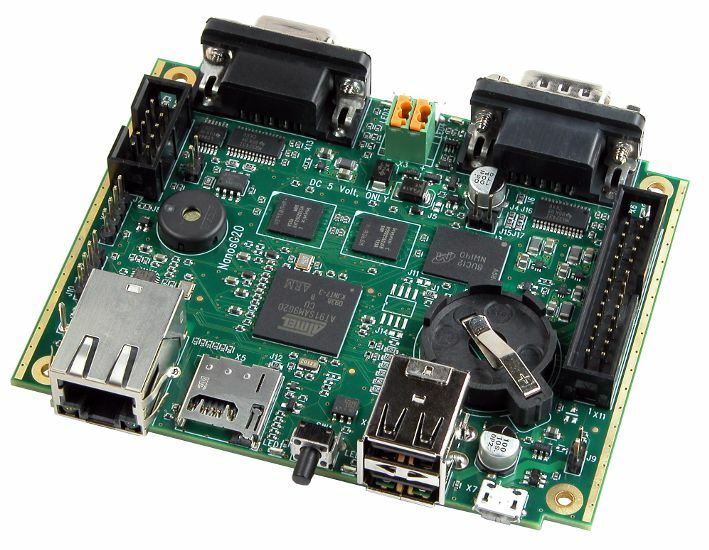 At the heart of the board is the ATxmega128A1 microcontroller, which is equipped with a four-channel DMA controller and an eight-channel event system, and can run at clock speeds of up to 32 MHz. XmegaA1-Board supports many standard interfaces and you can attach custom peripherals via an extension bus. The xmega Board is well-suited to many areas of measurement and control technology, i.e., for light/motor control, measurement logging, system monitoring or as interface converter. The example AES has been fixed. This sample shows how to make ADC conversions using the AT91 PDC and timer. Measurements are completely auto triggered leaving CPU time for other tasks. Timer0 is used to start the conversions, Timer1 is the timebase for pseudo-taskswitching. The industry magazine "Elektronik & Entwicklung" called on its readers to nominate the best products of the year. In the "Embedded Systems and Components" category, readers then voted on 50 new products submitted from October 2007 through September 2008. 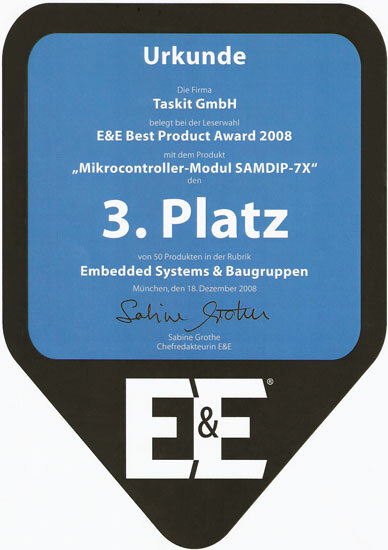 Taskit won 3rd place in the "Embedded Systems and Components" category with its microcontroller module SAMDIP-7X. The SAMDIP-7X boasts TDES and AES encryption systems. SAMDIP-7X stands out for its many interfaces, low power consumption and compact format of just 81.3 x 25.4 mm. From now on, the SAMDIP-7S will be equipped with a new connector, which brings the following advantages. The new pins measurements are 0.64 x 0.64 mm (+/- 0.05 mm) and are square. SAMDIP-7S continues to be available with the old connector, but will require a longer delivery time. Please make your needs known to us as early as possible. SAMDIP-7S is in stock with the new connector. Going forward, the SAMDIP evaluation board will only be available with the new socket. We advise all customers to migrate to the new connector. We will be happy to answer any questions you may have. This program uses SAMDIP's hardware encryption unit to encode strings read via USART in Cipher Block Chaining (CBC) mode. Using CBC ensures that the same string encoded twice will not produce identical output. The program reads in strings via serial connection, encodes them and sends the output back. This program shows how to use SAMDIP-7X's EEPROM. It can also be understood as basic I2C/TWI sample. Commands allowing access to the EEPROM are read from debug port, transformed to EEPROM commands and send over TWI. Output is shown on debug port. Available commands are printed at startup vial debug port. This program illustrates very simple SPI access in master mode. Data transfers are made in a non-blocking, interrupt driven way using DMA. Status information appears every second over serial line.